Replicare Thin Hydrocolloid Wound Dressing from HealthyKin.com is a hydrocolloid dressing that is made from a polyurethane film with a thin layer of absorbent colloid. The sterile, no-touch, self-adhering application system makes Replicare Thin simple to apply – even while wearing gloves. High cohesive properties keep the dressing from falling apart and leaving residue in the wound, so there's minimal risk of local irritation. 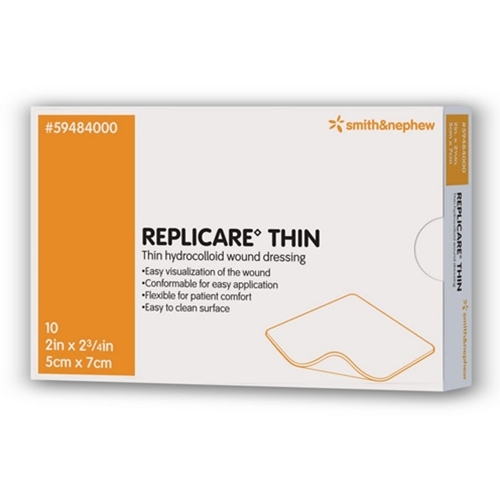 Like original Replicare, Replicare Thin stretches easily and returns to its original shape more completely than other hydrocolloid dressings – even over joints. This suppleness and flexibility allows the dressings to give without migrating, minimizing granulation tissue injury and damage to periwound skin integrity. Replicare Thin permits increased ease of patient mobility without uncomfortable pulling of the skin, especially over joints. The dressing's thin profile also makes it cosmetically acceptable to patients. Replicare Thin promotes more cost-effective use of material and resources and nursing services. The dressing is totally transparent, so there is no need to disturb the dressing to check for saturation or healing progress. The waterproof polyurethane film cover material allows the dressing to be easily cleaned and permits patients to bathe or shower without the need for a dressing change. The dressing also aids in the prevention of bacterial contamination. The no-touch application system results in fewer wasted dressings, and the combination of conformability, adhesion and absorption extends wear time and reduces the risk of wound contamination. Sturdy and yet thin enough, great size and shape for a tailbone pressure sore. Worked well, will order more in future. Stayed on better than most such bandages we have tried. The product proforms exactly as described. Will buy again.